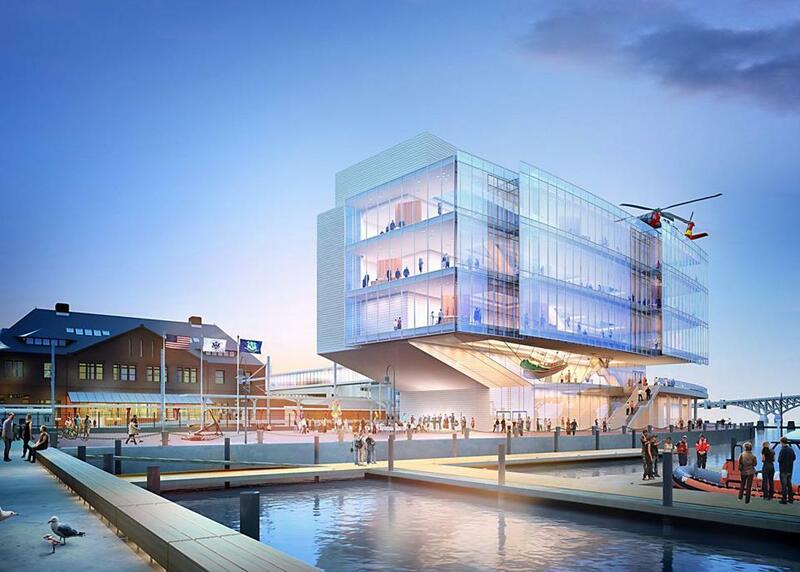 An architectural rendering of the proposed museum on the New London waterfront. The Coast Guard motto Semper Paratus, or “Always Ready,” also could apply to the quest to build a new museum honoring the smallest branch of the armed forces. Supporters have been ready — and waiting — to make the project a reality for more than a decade. Now the wait may finally be over. Supporters of the National Coast Guard Museum say the effort has gained new momentum and the $100 million museum will become a reality in New London, Conn., soon. Plans for the national museum have come in fits and starts, amid disagreements over a location and funding. But the Coast Guard effort got important support earlier this year when President Trump signed a stopgap federal budget that included $5 million in funding for a new museum. Trump also spoke at the Coast Guard Academy commencement in New London in May. Also critical to the museum’s renewed effort: a decision by officials in the seaport city to deed about a third of an acre of land along the Thames River to the Coast Guard for the project. Such changes signal a major turn for the Coast Guard Museum Association, which was founded in 2001 to make a national museum a reality. While there are more than 80 national museums devoted to other branches of the US military, efforts to build one dedicated to the Coast Guard have stalled several times, but in recent years have gained significant momentum. The association said it will rely on a total of $30 million in federal funding and $50 million in private donations. The state of Connecticut has also committed as much as $20 million for a pedestrian bridge over an Amtrak railway. Currently, the Coast Guard is the only branch of the armed forces without its own free-standing museum. A 5,000-square-foot area on the grounds of the Coast Guard academy currently showcases historic artifacts, but overflow items sit in a storage facility in Maryland, Grahn said. Supporters said it’s been a long wait for a military branch that was overseen by the Department of Transportation but transferred to the Department of Homeland Security after 9/11. The Coast Guard’s mission ranges from marine safety to drug interdiction. “The Finest Hours,” a 2016 film based on the book by Casey Sherman and Michael J. Tougias about the 1952 Pendleton rescue off New England, is one of the many stories waiting to be told, said Susan Curtin, a member of the association’s board of directors whose father, JD Power, founder of JD Power & Associates, was a Coast Guard lieutenant who served on a Boston-based icebreaker. Honoring that legacy with a large-scale museum, however, has been marked by ups and downs. In the early 2000s, Fort Trumbull State Park in New London had been identified as the likely place for a museum. But four years later, Connecticut officials were surprised to learn that the Coast Guard was contemplating the creation of a new museum outside the state, including a location in Battery Park in New York. Connecticut’s congressional delegation stepped in, and then- President George W. Bush signed a bill into law that effectively said the museum could not be built anywhere but New London. Connecticut Governor M. Jodi Rell announced that a $60 million museum would be built on a 2.7- acre site at Fort Trumbull, but just two years later, the economy tanked and those plans were delayed and later scrapped. In 2013, a new option entered the mix. The owners of Union Station, the historic building designed by influential architect Henry Hobson Richardson, presented a conceptual drawing of a downtown museum adjacent to the station and accessible by car, train, and boat. The idea took off and the next year, then-Mayor Daryl Justin Finizio announced the city would deed the land to the Coast Guard for the museum. Since then, the size and cost of the project has risen to $100 million. The association has raised nearly $10 million in private donations to fund the project. And the site is currently undergoing a public review. Supporters have said the museum, although tax-exempt, will be an economic driver for all of Southeastern Connecticut because of the volume of people drawn to the waterfront. The cross-town ferry that brings 1.2 million people to Block and Long islands, and a nearby Amtrak station that shuttles 2 million passengers annually, will provide a ready-made audience, they say. The current New London mayor, Michael Passero, said a small number of residents remain concerned over how much of a tourist draw the museum would be. But he has no doubts that it will be built, or that it will succeed in tandem with other waterfront development.